In a recent note (Rock Talk—Is it all awash, or not?) 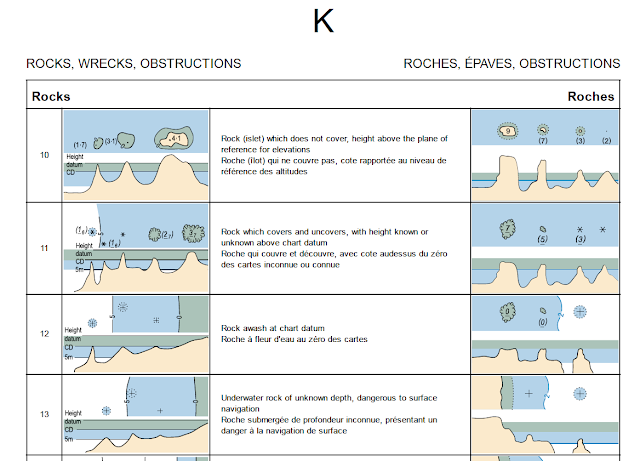 we discussed minor conflicts in paper-chart rock symbol terminology for a rock that covers and uncovers, height unknown (US supplemental symbol Ka and INT 1 symbol K11). One of the virtues of moving onto electronic navigational charts (ENC) is we no longer rely on the design of the symbol to convey specific information, and instead we get this from a direct query of the ENC database. This database uses an internationally accepted terminology that overrides national nuances. 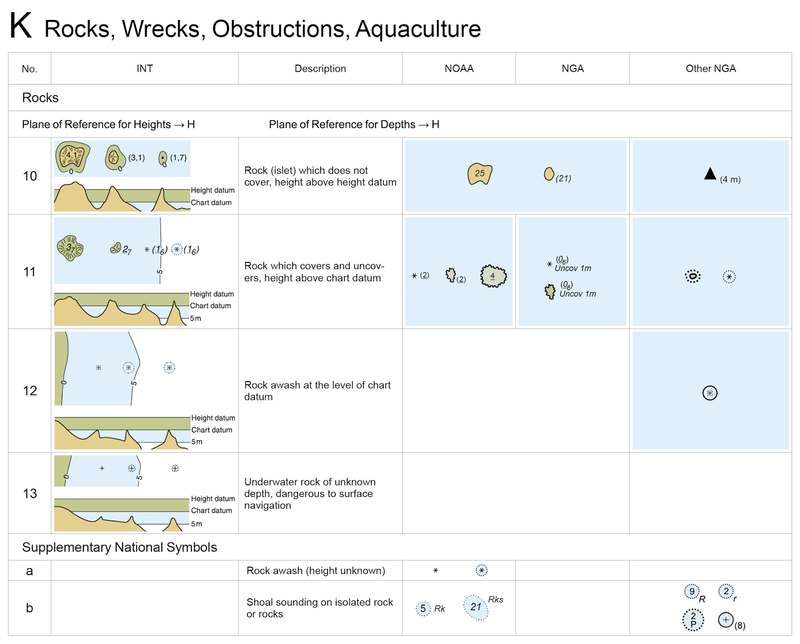 Below is a summary of common paper-chart rock symbols with a graphic presentation of their relative soundings. Figure 1. Common rock symbols used on paper charts and RNCs. ENC charts, however, have simplified the actual symbols, not just for rocks, but also for other objects traditionally shown on paper charts. Part of this difference is schematically shown in Figure 2. Going forward, we can abbreviate "paper charts" with RNC (Raster Navigational Charts), because that form of an electronic chart is just an image of the actual paper chart. The figure caption also refers to INT 1, which is the International Hydrographic Organization (IHO) standard for paper chart symbols. The use and meaning of rock symbols on ENCs are not the same as they are on paper charts. We have gone from seeing some 6 or 7 "rock symbols" that tell us much about the rock from the symbol alone and knowledge of the tide height, to seeing just two different rock symbols on an ENC, some of which may not show at all, depending on how we have the optional soundings set—which brings up the crucial ENC topic of the "isolated danger" symbol, which is a powerful new feature of ENCs; the subject of a later note. When using ENCs, we must learn to get crucial information from clicking the symbol (called a cursor pick) and reading about it in another window. The rock symbols alone no longer convey detailed information. This change in chart reading practice required when using ENCs can be a challenge, depending on individual experience. Having used paper charts for 30 years, my initial attitude toward these simplifications of the symbols, and rock symbology in particular, was negative, and I was not timid in complaining about it. However, the more I have used ENCs and studied the goals of the IHO in their "new" system (it is actually some 10 years old at this point! ), I have changed my opinion on this. Although we might miss our traditional symbols, there is much virtue in not having to learn all the nuances of the traditional US rock symbols in the first place. In fact, many mariners who did not need to know these details to pass a navigation exam may not have been aware of all the information contained in the paper chart symbols. It is not even that transparent when searching Chart No. 1, without training on the use of that important publication. Using ENCs, we only have to teach that there are two types of (common) rock symbols, an isolated asterisk or an isolated plus sign in a dotted circle. To know more about that rock, just click it. The procedure is easier to learn than memorizing multiple symbols, and probably a safer way to use charts. We must train ourselves to click every rock that is near our route. An asterisk is a rock that covers and uncovers as the tide changes between 0 and MHW (a K11 or K12 rock in INT 1), and a circled plus sign is a rock which is covered when the tide is 0 (K13). Note that we see a plus sign with or without a ring of dots on an RNC, but it aways has a ring of dots on an ENC. A ring of dots in all charting means a special hazard. The way we learn more specifically what an asterisk rock means on an ENC is a cursor pick. Then we will be told the "value of its sounding." An asterisk rock with the (9) beside it on an RNC will report a sounding of -9.0 ft in the ENC. In ENC reports, a negative sounding is a drying height. Figure 3. A K11 rock shown on an RNC (left) and on an ENC (right). Note drying heights are negative numbers on ENCs. Here the drying height is 0.8m = 2.6 ft.
A plus sign with 4 dots on an RNC (INT 1 symbol K12), will show up on an ENC also as a plain asterisk, and a cursor pick will report sounding of 0.0. 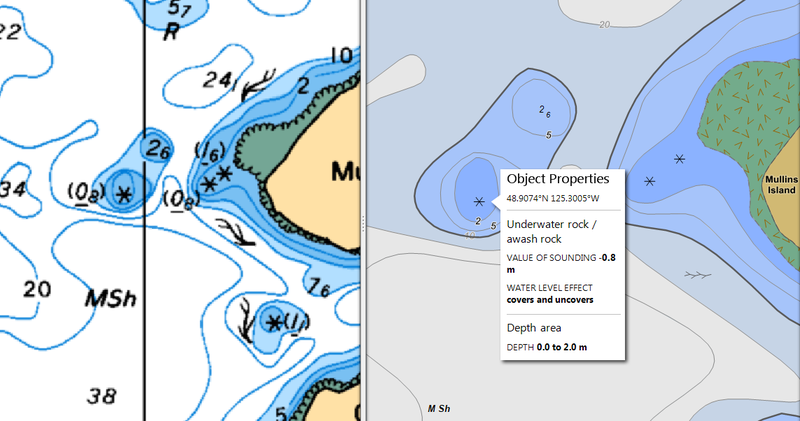 Recall that all soundings are relative to 0 tide height, so when the tide is zero, this rock is right at the surface. Figure 4. A K12 rock shown on an RNC (left) and on an ENC (right). A sounding of 0.0 means this is a "rock awash" in the IHO definition, but not in the Bowditch definition, a point we discussed in Rock Talk—Is it all awash, or not? Figure 5. Another example of a K11 (NOAA Ka) rock shown on an RNC (left) and an ENC (right). Figure 6. Example of a K12 rock shown on an RNC (left) and an ENC (right). Both are official Canadian HO products. Note the slight color pallet differences between US (Figure 4) and Canadian RNCs (Figures 5 and 6). ENCs meeting IHO standards all use the same color pallet, regardless of national origin, which is another small step forward. Notice in both Figure 5 and 6, how much "cleaner" and more precise the chart looks on an ENC in these examples, compared to the largest scale RNC for the region. This often can be an aid to navigation, BUT we must be careful when over zooming, as shown in both of these pictures. Over zooming an ENC maintains the sharp lines, which gives the impression of a higher accuracy, which might not be justified by the actual survey data the chart is based upon. Both RNCs and ENCs are intended to be used at their native scale, although in practice we often over zoom them. The difference is the RNC gets fuzzy and pixelated, which is a warning of sorts, but the ENC does not. Rock Talk — Is it all awash, or not? 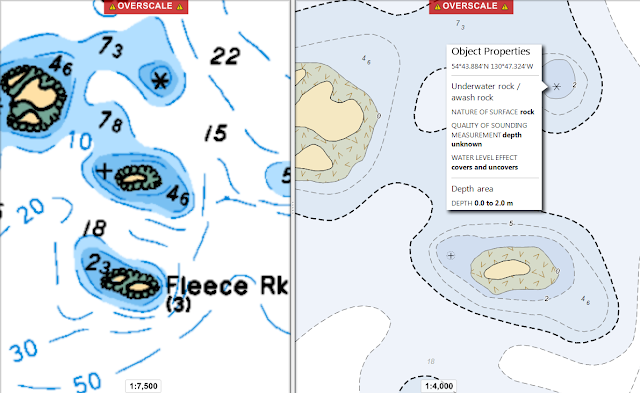 We are preparing new training materials on the use of electronic navigational charts (ENCs), which brings up an issue navigators face when moving from paper charts to ENCs—namely, rock symbols and how these differ between the two formats. The most common rock symbol seen on a paper chart is a simple asterisk. This is a rock that shows above the surface when the tide is 0 or less, but it is covered by water when the tide is at or above mean high water (MHW). If there is nothing printed near the asterisk on the chart, then that is all we know about it. On the other hand, if there is an underlined number in parenthesis near it, ie (6), then that 6 is the drying height of the rock, meaning when the tide is 0.0 the top of the rock is 6.0 ft above the surface. At a tide level of 5 ft, the rock is just 1 ft above the surface, and any tide height greater than 6 ft covers the rock. The number is in parenthesis so it is not confused with nearby soundings. 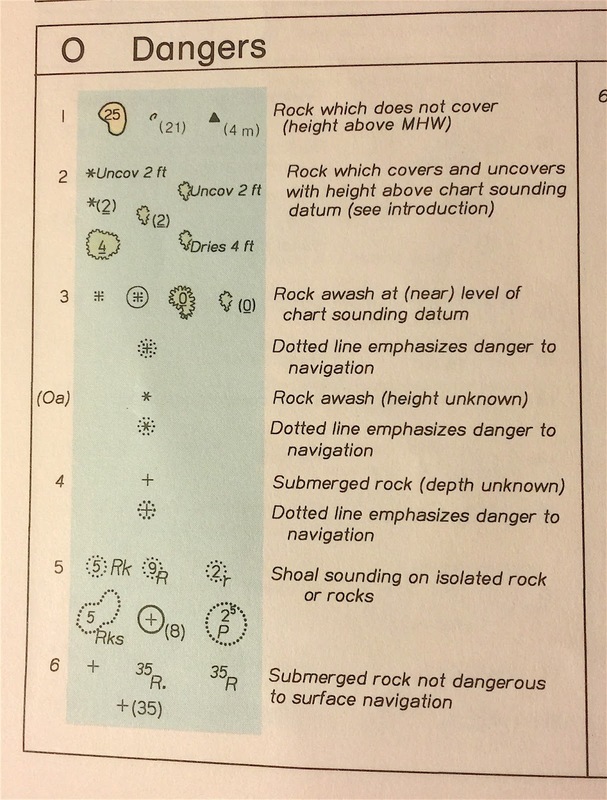 When we start to work with ENC rock definitions, however, we run across a bit of a stumbling block in the definition of this isolated asterisk rock when there is no drying height charted. For a historical perspective, we refer to the definitive American reference on chart symbols, the booklet called NOAA Chart No. 1, and specifically to the 8th edition, issued Nov, 1984. We see the rock in question as entry O(a) in Figure 1, which is distinguished from the same symbol with a drying height charted, which is rock O2. The plain asterisk rock, (Oa), is defined as "Rock awash (height unknown)." Most symbols and labels used in the 8th edition of Chart No. 1 were based on those of an IHO (International Hydrographic Organization) resolution from 1952. But note that the label of the "rock awash," (Oa) is in italics, in parenthesis, and not part of the normal sequence of rock labels in Section O. This is explained in that edition to mean that this is a symbol that does not have a counterpart in the 1952 IHO list of symbols. In short, this is a unique NOAA symbol, not an internationally adopted symbol, but there is more to this story. When we move to the 9th edition of Chart No. 1 (April, 1990) we see two things. 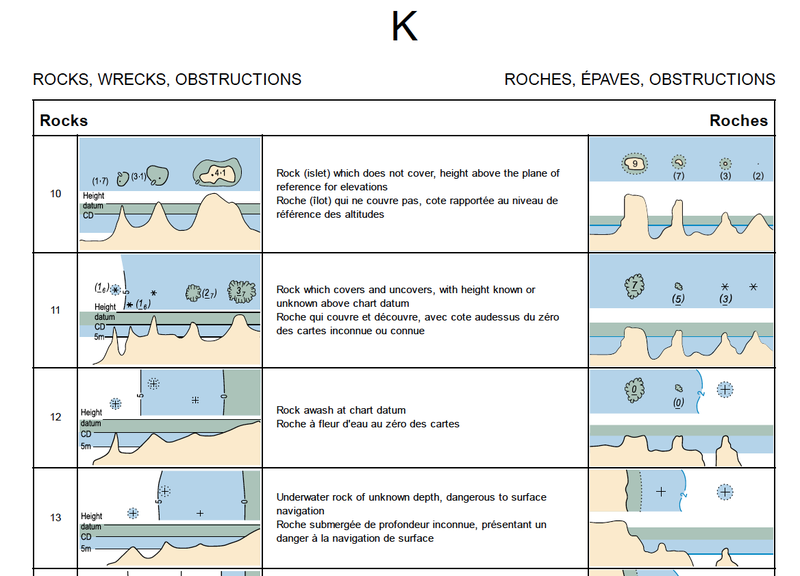 First, rocks are no longer in a Section O—Dangers, but are now in Section K—Rocks, Wrecks, Obstructions, and we see a new subsection of Section K called Supplementary National Symbols. The rock awash symbol is now called symbol "a" in this new list, which we might call Ka. The change in section labels (ie O goes to K), and the motivation to separate out unique US symbols into a list called "Supplementary National Symbols" is likely due to the appearance of the first edition of the the IHO paper-chart symbol standards called INT 1 in 1987—between the 8th and 9th editions of US Chart No.1. 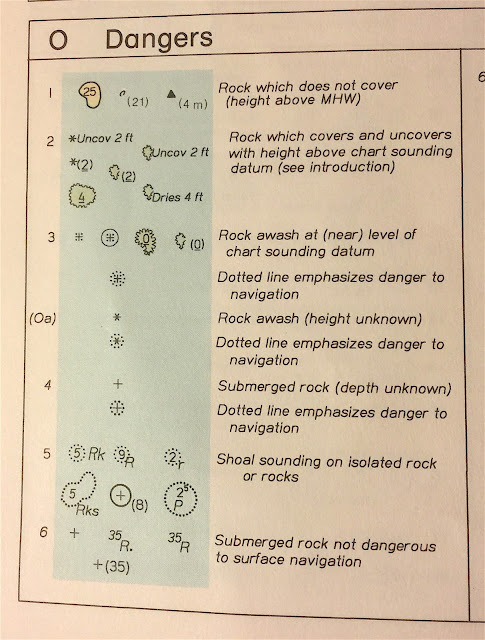 After the appearance of the IHO's INT 1 standard, we find that the cataloging of common paper-chart rock symbols has remained essentially unchanged in the US from those of the 9th edition. A sample of the latest edition (12th, dated April, 2013) is shown below. Figure 3. Selection of Canadian Chart No. 1, which follows INT 1. Notice that the US Rock Ka is part of the INT 1 K11 group, and it is in fact presented that way by all other nations. Check the US definition of K11 and this rock is not included—that is, an isolated asterisk without any drying height specified. You may fairly ask at this point—if not earlier!—why we care about such details? The answer is this. Once we move to ENC usage, most rock information is included in the text descriptions of the rocks. The symbols are greatly simplified and we have to "cursor pick" (mouse or trackball click) the rock to read what kind it is. So a precise description of the rock is crucial. We are also trying to figure out why this US Ka rock is left as a US Supplementary Symbol and not just moved into the K11 group. It seems we are being called back to the definition of "rock awash." USA Chart No. 1 has always pointed out that if you need more help understanding the terms, refer to Bowditch, American Practical Navigator. Below is the latest Bowditch definition of "rock awash." But we have to admit that the rest of the world does not use this terminology, and that fact comes more to the front when we start using ENC. The isolated asterisk rock K11 in INT 1 is defined as a "Rock which covers and uncovers, height unknown." This is frankly better and more precise terminology. 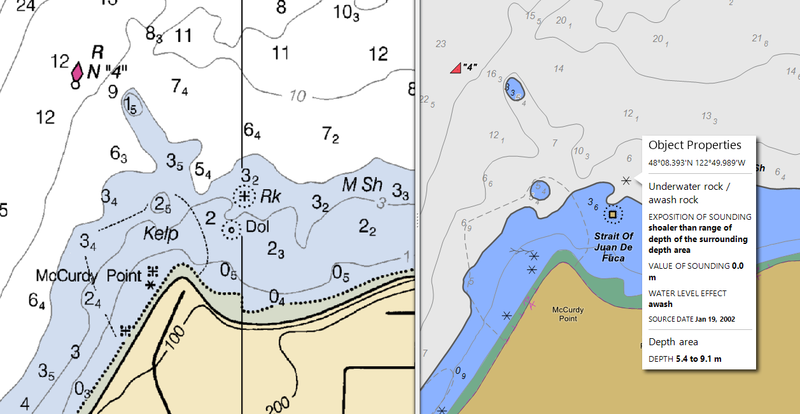 The word "awash", outside of a US navigation context, means what we think it means: the top of the thing is above the water to some extent, with water washing up against it or just over it. Thus the US rock symbol Ka called "rock awash" really means "a rock that will be awash at some tide level, but we do not know what that level is." In short, it is a rock which covers and uncovers, height unknown, which is the definition of INT 1 rock K11. The word "awash" could then only appear in the definition of K12 (the plus sign with 4 dots) which is defined by both the US and INT 1 as "a rock awash at the chart datum," and which is, indeed, the IHO definition of "rock awash" as presented in S-32 the official IHO Glossary. Figure 5. IHO Glossary, S-32, 5th ed, 1994. This is not the same as used in Bowditch (Figure 4), so we propose that the next edition of Bowditch include this alternative meaning. It seems that change would simplify US paper chart symbols, and lead to an easier transition into the use of ENC. I know of at least one navigation school, who will no longer refer to the isolated asterisk as a "rock awash." In a follow up note (Rock Talk 2 — RNC to ENC), we look at how rock symbols are presented in ENC. But before leaving I want to stress that the latest edition of NOAA Chart No.1 is a major milestone in such publications in that starting with the 12th edition, NOAA Chart No. 1 includes for each paper chart symbol the corresponding symbols used in electronic navigational charts, specifically those following the IHO S-52 standard used in ECDIS (electronic chart and display systems). NOAA Chart No 1 is now more than ever a unique and especially valuable publication for all navigators, worldwide. There is a free pdf version online. To appreciate how lucky we are, the British Admiralty publishes this same data in two books NP 5011 ($35) and NP 5012 ($34). A special thanks to Brian Voss, Librarian of the NOAA Library in Seattle. He has shown us many times the crucial value of real libraries and real librarians in this Google age. This is a holding place for an article to be added in the Spring of 2017.